I recently learned of several small art movements that are relatively new to the list of “isms” that make up art history. Along with post-modernism and conceptual art we can add funism, thinkism and stuckism. Funism proponents believe that art should be as much fun to look at as it is to think about and that art should be intellectually engaging without being intellectually elitist. Thinkism claims to be the first art movement of the 21st century and suggests that art shed light on various social, philosophical, political, environmental, psychological and religious issues. Stuckism is an international art movement for contemporary figurative painting with ideas. Proponents claim it’s anti- the pretensions of conceptual art, and anti- the notion of anti-art (rooted in Fluxus). One website claims there are 206 stuckist groups in 48 countries. And what does this have to do with the senior art majors’ exhibition at Fort Lewis College, you might be asking? Well, as it turns out, just about everything. In Durango, art students are not always exposed to the newest, most avant-garde work from the finest galleries and museums in New York, London and around the world. They are likely not familiar with Ryan Trecartin, the twenty-something art phenom from Philadelphia known for his disjointed videos or Cao Fei, the Beijing artist who explores the rapid evolution of Chinese society and cultural trends through photography, video and new media. They can identify the work of über artists Jeff Koons, Damien Hirst and Takashi Murakami because well, frankly, those images are everywhere – you’ve probably seen the giant shiny balloon puppies, diamond encrusted skulls and neon flower and eyeball patterns, too. Viewing the exhibit in the FLC gallery, I am reminded that there is a purity of purpose to the art these students create, based in the traditional mediums of painting, sculpture, photography and design. One will not find a fine art video or audio installation at FLC. (That may be problematic for students who want to pursue their MFAs, as new media art is everywhere.) What one will find is strong, elemental and basic design skills from the graphic students who show an eye for color, negative space and typesetting. 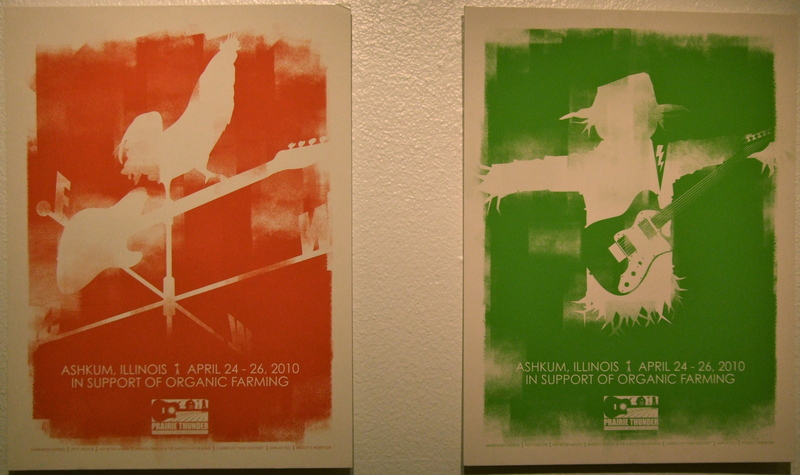 I was particularly fond of the “Prairie Thunder” music festival posters by Ian Doig for their simplicity and powerful use of color to attract my attention. Deana King produces something of a hybrid between graphic design and drawing in her white on black “Velvet Acid Christ Posters” a work that might qualify for the thinkism movement for its apocalyptic symbolism and imagery. Miller, a close up of a face featuring intense turquoise eyes. Shellie Douglass shows two nudes created by drawing on Mylar that is then exposed to sunlight to create solar plate etchings. 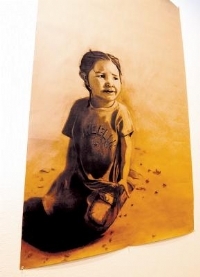 She also shows “Libby” a charcoal drawing of a pre-teen girl bent at the waist looking sadly, angrily or disinterestedly at the viewer, hands clasped between her knees. Douglass and Slater Bootenhoff share a collaborative drawing that results in an image with tension between the figurative and the organic that may qualify as a stuckist work. Bootenhoff’s paintings were my favorite pieces from the show, though both are very different. 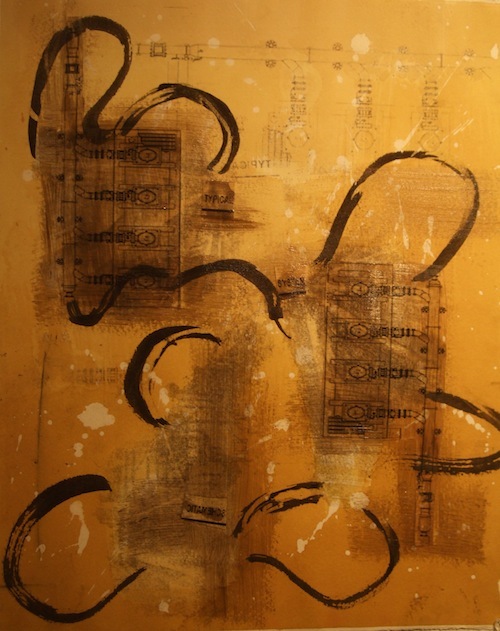 “Typical System Schematic” is mixed media featuring layers of what might be drawing, sumi-e ink, printmaking, painting and etching in rusty colors and black. 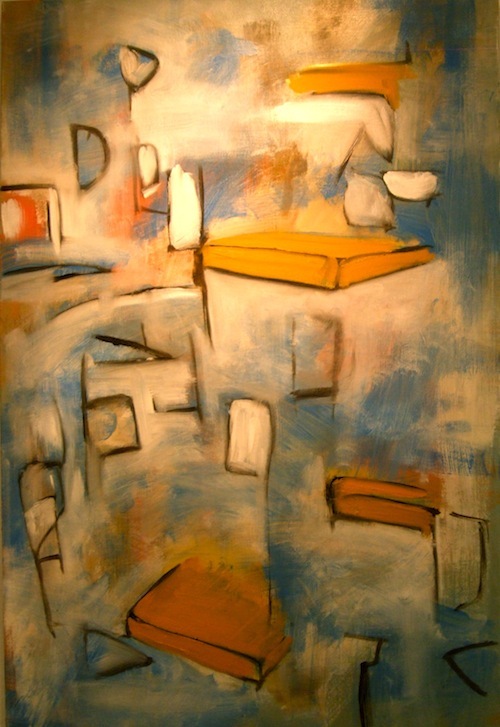 His oil painting, “Lift,” employs a similar orange color with blue and white resulting in a sophisticated work of abstraction. In the category of funism, I would situate Araina Marsden’s “Tetris” sculpture, a wooden drawing of a doll playing video games on TV, and Shannan Cruise’s “Literature Alive,” a playful yet dark octopus-like creature emerging from a stack of opened books. So when it comes to the distinction between the latest art movements and what is happening in art programs like the one at Fort Lewis, we see that the line is malleable, and a foundation in the basic elements of art making is likely to stand the test of time. “Flying the Coop,” an exhibition by Fort Lewis College senior art majors, through April 30 in the FLC Art Building Gallery. The exhibit is free and open to the public; gallery hours are 10 a.m. to 4 p.m. Monday through Friday. For more information call 247-7167. Hi there, I liked this article a lot… nice to see a focus on local activities! Funism proponents believe that art should be as much fun to look at as it is to think about and that art should be intellectually engaging without being intellectually elitist. I’m all for this. Any websites to see their art? You can also query google images for artwork by putting in the phrase funism art. Enjoy!